In the most recent historical period the appearance of capitalism, as a medium of social differentiation and as the basis for a new social structure, has momentarily distorted the whole development of the traditional struggle of races. Inequality of men -- instead of being based on the unequal physical, intellectual and moral value of persons, on the inequality of their aptitudes, and on the inequality of their race -- has been based on inequality of wealth. But, from the study of races and their specific tendencies, it emerges that the conception of the world that uses wealth and not personal merit as the criterion for assessing human value is the specific property of a certain ethnic group. Consequently, [this new social structure] can last only as long as the dominance of the race that bases its conception of the world upon [wealth]. This race is not Aryan. Capitalism, as a means of expressing [that race's] aspirations and as a social structure corresponding to [that race's] conception of the universe, is therefore only an accident in the history of the Aryan world. It is the expression of the temporary dominance over the Aryan world of a foreign ethnic stratum, a dominance that can last only for as long as the Aryan world will tolerate it. 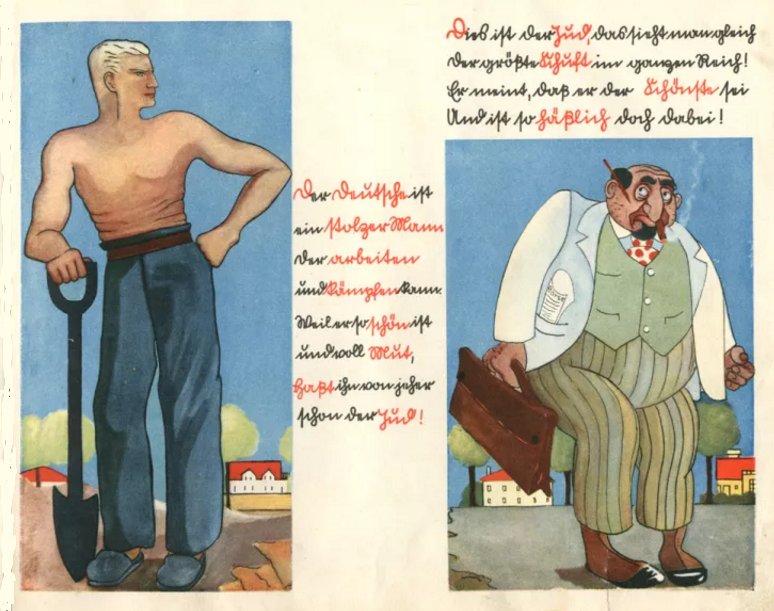 It is nevertheless useful to summarize in a few sentences the mechanism of the transition from the Aryan society of the feudal type to capitalist society, the modern form of the oppression of Aryans, which has been placed in power only because of the Aryans themselves. During the decline of the Roman empire, ever larger groups of Germans were gaining entry into the Empire. The conquest itself, known as the "great barbarian invasions" was only the coronation and finale of a long established state of affairs. The Germans had occupied the Empire before invading it militarily and seizing power. In accord with the usual mechanism of racial struggles, the old autochthonous races were relegated to economic and political second-class status in a mostly Germanic society. If [the German conquerors] participated in Latin culture to the extent that it was valid for them, they imposed the social structure of the Nordic peoples. In particular, they affirmed, first, the contempt that one finds among all peoples of the north from the earliest periods of their civilization: contempt for gold and for the power that it could confer. Refusing to become merchants of silver, which they considered degrading, they left it to the members of foreign races in Europe regarded as less noble. Socially they left the management of fortunes and dealing in gold to lower races -- Jews and others -- just as at the present time one entrusts to an accountant the custody of a coffer or till. On the other hand they devoted themselves traditionally to all creative efforts. The discoveries and conquests of lands, as well as great inventions, are uniquely their work. In the epoch corresponding historically to the Renaissance in the European West, they simultaneously discovered new lands and new means of production. The discoveries of lands caused enormous fortunes to flow into the coffers of the dealers in gold. The scientific and technical inventions immediately conferred a new importance onto the fortunes that they had conquered. It is at this moment and only at this moment that the development of the means of production began to depend entirely on hoards of wealth, and not on labor alone as in preceding ages. The products of human labor, instead of remaining individual values​​, became social values. Industrialization, to the degree that it was obliged to make an appeal to the gold-dealers in order to develop, passed into their control and escaped that of its creators. Gold no longer served to meet individual needs but likewise became a social value, to the degree necessary for acquiring the means of production and raw materials. The situation was as follows: Aryan man conquered fortunes that he entrusted to be managed by the men of lower races who were relegated to this servile vocation. Then he invents new means of production. He makes an appeal to utilize and to build on the fortunes that he has conquered. The dishonest treasurers and rebellious servants who keep those fortunes exert demands before returning them to their rightful owners. They first demand economic rights, then political rights. The "bank" imposes its conditions on the Aryan men who allowed it to be born in the preceding epoch. The bank even begins to deny the facts (1) of the Aryan origin of capital, (2) of the social rather than personal value of this capital, and (3) of the exclusive right of the Aryan to control and to own capital. At the time of the Roman Empire's decline, the Germans had little by little taken possession of the means of production, land, and the means to keep it, weapons. Finally they had seized political power. At the time of the advent of technical progress, a different racial stratum, of inferior race, little by little seizes the means of production through the agency of the bank. It then arrives at political power and general dominance. But, there are fundamental contradictions : (1) it possesses the wealth without the genuine entitlement that comes from superior merit, and (2) it has no control over the means to keep it: weapons remain in the hands of the only men of merit and courage, Aryan men. Capitalism is thus a mere historical accident and a growing-pain of Aryan society. This [system] will last only as long as the Aryans will accept it. The first inventions, the construction of the first machines, then the possession of these new means of production, became the privilege, not of those who were the most capable of creating them and who in fact did create them, but of those enabled by gold to acquire ownership. The means of production escaped their true owners. The master became not the one who ranked race before all, but the one that gold made master over the labor of others. Selection was inverted. Lacking control of the gold that had been originally only a convenient medium of exchange, the man of good race lost his independence in relation to the serf and the usurer of the ghetto. In certain cases, and especially in the new countries, men of good race undoubtedly were able to achieve prominence, but they could do it thanks only to the gold that they had acquired, and not to the superiority of their abilities. They had to accept the rules of a game of which they were not the masters, and to respect standards imposed by the inferior races that possessed wealth. Thus, with the advent of capitalism, the divisions of class appeared in new forms, not as an effect only of the inequality of races, but as a consequence of the inequality of fortunes. Possession resulted not from more or less profuse creativity, but from more or less aptitude for stealing the fortunes or the labor of others. The promotion of the inferior social-racial strata, their accession to power, simultaneously compelled society to change its conception of the world and its political structure. On the way to usurping power, the inferior races were obliged to seek and to find a principle that could justify this usurpation. I wish for more discussion about Rene Binet and his theory. How compelling! He really does turn Marxism on its head in order to beat it thoroughly with his theory about race and Aryans. This Part 3 really is the proof of that idea. If only White people wouldn't be so afraid of the word "racist"!! René Binet and his “Theory of Racism"